My contest is over and I want to extend it. What do I do? As a client, you have 3 (three) days to select a contest winner. Log in to your Sribu account and click your contest name. At the contest page, click the "Upgrade Contest" button. Click the “ Extend Contest Duration for 3 days”, an extra charge of IDR 300.000,- applies. 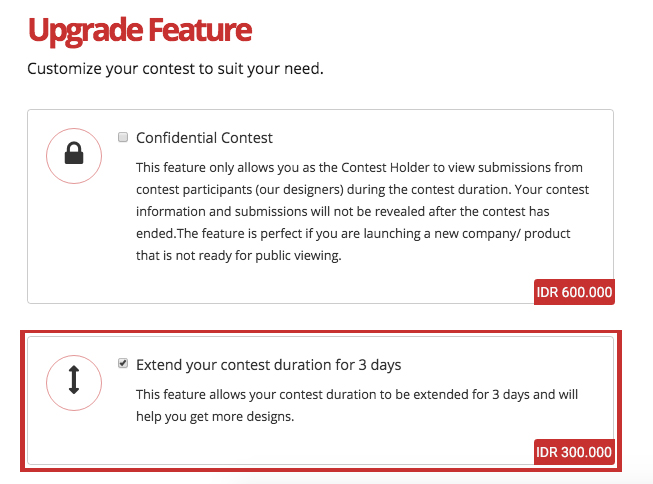 Confirm the extension by clicking the ‘Upgrade Contest’ button. On the next page, you will be able to see and review invoice details of your order. Proceed to payment through bank transfer, PayPal ore credit card. You may also contact our customer service by email at ask@sribu.com and phone at +6221 3110 6996 or webchat at Sribu website.